This weekend featured two Pens games, a big Pitt homecoming game, and one of the marquee matchups of the 2009 NFL schedule. I think we can all say that a 3-1 record for our teams was an enjoyable and acceptable showing. Thoughts? Oh, I've got some thoughts. 1.This was the game everyone was waiting for from the Steelers' defense. We've been getting used to watching Ben Roethlisberger save the day, but to witness what the D did in the fourth quarter on Sunday was downright awesome, especially given the fact that A. they've been horrible in the fourth all season, B. they were missing Aaron Smith, Lawrence Timmons, and Travis Kirschke at the time, and C. they awoke from their season-long funk against an offense that features the best running back in the game and one of the best signal-callers of all time. This was a statement by the men on that side of the ball that the Steelers' defense is still a unit to fear. 2. That being said, I don't think Adrian Peterson got the memo about fearing the defense. In fact, if anyone's going to have nightmares, it's going to be William Gay. But I'm sure the rest of the league will fear the Steelers' defense. 3. As expected, this game came down to the final 15 minutes. There were 23 points scored in the first three quarters combined and 21 scored in the fourth alone. But if I would've told you that the touchdowns would've all been between 77 and 88 yards and scored only by the defense and special teams, I'm guessing few would've believed me. Casey Hampton rushed over to him and began to verbally tear chunks of flesh from Skippy's burnt carcass. I couldn't hear what was said, but it was obvious that Big Snack thought Skippy could have shown a bit more effort." Is this one of the worst contract years ever by a player? Yes, it is one of the worst contract years ever by a player. 5. Speaking of bad contract years, all signs point to Willie Parker's time in Pittsburgh coming to an end after the season. The two-time Pro Bowler, who had over 1,700 yards of offense and 16 TDs in 2006, had one carry for two yards on Sunday and was basically an afterthought. 6. And speaking of afterthoughts, has anyone seen Hines Ward? How does the league's leading receiver get only three targets and one catch in a big game like this? 7. Yes, Limas Sweed has been a massive disappointment, but the Steelers appear to have hit a grand slam with Mike Wallace, who was invaluable on Sunday with some yuuuuge plays, including grabs of 40 and 22 yards and his second career TD. The quick emergence of Wallace, who should be an Offensive ROY candidate, more than makes up for the Sweed whiff in 2008. 8. We've also got to give some love to the much-maligned and much-improved Steeler offensive line. Going against the likes of the Williams Wall and Jared Allen on Sunday, they held their own, giving Roethlisberger adequate time to throw and opening enough holes to give Rashard Mendenhall a 6.9 YPC average. Kenny Britt (TN) 85, Johnny Knox (CHI) 70, Chad Ochocinco (CIN) 54, Vincent Jackson (SD) 56, Dennis Northcutt (DET) 70, and Mohamed Massaquoi (CLE) 83. Again, here are Rice's stats against the Steelers: 14 targets, 11 catches, 136 yards, and a long of 34 yards. As Peter King would say, "Good numbers. Lofty numbers." 10. We've already gone through nine points and I haven't talked much about Big Ben, probably because he was held mostly in check (at least by his 2009 standards) with a mortal 14 completions and 175 yards on Sunday. Brett Favre nearly doubled Roethlisberger's yardage (334-175), but Favre also had two killer turnovers to Roethlisberger's zero. I wonder if Ben ended up getting Brett's jersey, like he talked about? 11. You know who had a great game on Sunday? James Farrior. 15 tackles, 1 sack, 1 tackle for a loss, 1 pass deflection, and a QB hit. The only defensive stat he didn't get was a touchdown. 12. James Harrison also had a solid game, with two sacks and three hits on Lord Favre. That's at least two sacks in three of the last four games for Silverback after notching just one through his first three games. Not coincidentally, the Steelers are 4-0 in those last four games and 1-2 in the first three. 13. Lamarr Woodley had 11.5 sacks last year and is on pace for just five this season. I'm sure he would tell you he wished those numbers were higher. But his first career touchdown on Sunday would probably rank right behind his sack of Kurt Warner at the end of the Super Bowl as one of his career highlights. 14. Fourth quarter heroics aside, one of the greatest moments from the defense on Sunday was their goal-line stand against the Vikes in the third quarter, saving four points when they forced Chilly Childress' hand into kicking a field goal. That series would probably be one of the little nuggets of confidence that would set up their fantastic performance in the final quarter. 15. The defense has once again gotten into the fantastic rut of not allowing 100-yard rushers. We're at 25 games and counting, with Peterson being limited to 69 yards on Sunday. And again, that's sans Aaron Smith. This was the game everyone pointed to as a time when the Steelers would truly miss him, but they really held up quite well in his absence. 16. I would not consider myself a Brett Favre fan. At all. His ritualistic waffling each offseason has become beyond bearable, as the franchise he's under contract to is kept in limbo at the most critical position on the football team. But for one afternoon, he added a healthy dose of excitement to what would've been an otherwise uneventful Steelers-Vikings interdivision game in October. Does Heinz Field get packed to a record number of fans with Sage Rosenfels or Tarvaris Jackson at QB? And is it a more satisfying win if it comes over Rosenfels or Jackson? I'm guessing the answers are no and no. It's OK to admit that Favre brings something to the NFL. I think it's his offseasons and the media's infatuation with him that make Favre a tiresome storyline most of the time. 17. 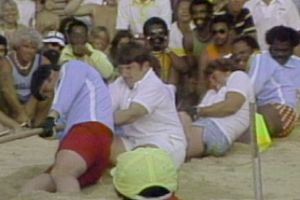 Other than the Steeler game, the coolest thing I saw on Sunday was an ESPN feature on the post-Super Bowl IX "Superstars" matchup between the Steelers and Vikings, a best-of-seven series of non-football feats of strength culminating in an epic 16-minute tug of war that left both teams exhausted on the Waikiki sand. ESPN's Page 2 has an accompanying story, and I highly encourage you to check it out. 18. The Steelers have an always-welcome bye week next on the schedule, and won't play again until November 9, a Monday-nighter with Denver. That means there are two Sundays where things might get done (other than watching football) in Pittsburgh. By the time that game finally does roll around, Steeler fans may be in full black and gold withdrawal. Emergency rooms will be full of Yinzers with something other than the swine flu. The Broncos will be either 6-1 or 7-0 at that time, so it will be every bit as big of a game as we saw on Sunday. Looking a little further down the road, the Steelers have a rematch with the Bengals on 11/16, their only home game in the month of November. They don't return to the Big Ketchup Bottle until December 6 against the always-entertaining Oakland Raiders. And in a season where we saw a rare trip by Brett Favre to Pittsburgh, how great would it be to see Al Davis and his black jumpsuit at Heinz Field? #11 - he didn't get an interception, either. Thrilled with the win, thought the O line was great, as well as the front D. The corners on the other hand... Are the Vikes that good, or do the Steelers just not make the plays? Converting the 3rd 17 near killed me. Nice Win. The third and long stuff has plagued them forever and an area that needs to be improved. Skippy Reed is a dead man walking at this point. Don, I liked the 'ole comment. Pretty obvious that Coach Tomlin has Mendenhall on a short leash and his fumbling is an issue. I feel we will have to seek a running back in the draft and through free agency next year. Willie just does not hit the holes any more. William Gay living up to his name. More missed tackles and getting run over like a tin can on the railroad tracks. He's just awful. I was a little more concerned with the massive cushions we were giving their receivers. Maybe it was a scheme thing or whatever, but Sidney Rice, Bernard Berrian, and Visanthe Shiancoe are not exactly Randy Moss, Wes Welker, and Ben Watson. Skippy just needs to visualize the returner as a giant paper towel dispenser, and he'll make a better tackle, I'm sure! on both long returns, which were favre's fault, he made Yepremian-efforts. that was much more pathetic than reed's. reed's a kicker, and skippy at least made an effort. he was faked out. 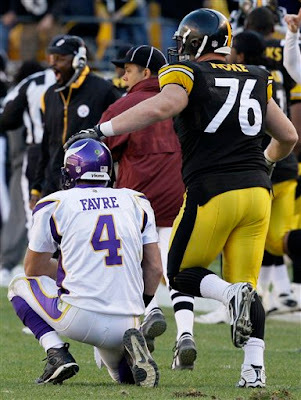 Kiesel's strip sack looked pretty similar to the last time the Steelers played Favre. McFadden/Polamalu return for TD during the Super Bowl XL year. The Broncos signed Mitch Berger to upgrade their punter. Think he might mimic Cedric Benson and boom some 80 yard punts in two weeks? Mitch Berger is an upgrade? I think the steelers actually looked outmatched for much of the game. If it weren't for the blown call to negate a favre TD, it would have been a much different game. If it weren't for? Please stop with this people. And if it weren't for the blown call to negate a Holmes TD, blah, blah, blah..."if it weren't for's" is the dumbest way to Monday Morning QB a game. Fact is; the Vikings had more than enough opportunities to cash in and win that game but didn't. In the end, you make your own breaks, the Steelers did and the Vikings didn't. That's the difference in this game, not time of possession, not 3rd down conversions and certainly not officiating. "What if's" and "if it's" are always the battle cry of the loser, just ask any Seahawks, Ravens, or Cardinals fan. Amen, Steve. I lost count of how many times Favre and his center simulated the snap with rocks and head snaps because it didnt effect the play. Bottom line is that the Steelers showed up when it mattered. We could also say "what if Mendy doesnt fumble and we go up 20-10 right there?". I am tired of people saying we get all the calls when we have the best pass rusher in the NFL and he is getting mugged by holds and illegal hands to the face on nearly every play and nothing is called. We could have said the same after the Bengals game when Hines gets called for the Patriots special "blocking while the ball was in the air" which wiped out a big gain and the next play was a pick 6! But we still had the lead and had more than enough chances to win that game too. Steve and Burrress - amen. Tired of this what if crap and the moaning about how the officals always do something to thelp the Steelers. I seeme to remember a game against the Colts where we won despite a poor call by the official on a Troy pick. Good teams overcome adversity. Plain and simple. We all know Lord Favre will develop some injury towards the end of the season and it will propel the Vikings into a a series of losses. By the way nice name Weekly NFL picks. Based on your comment Weekly should be Weakly.